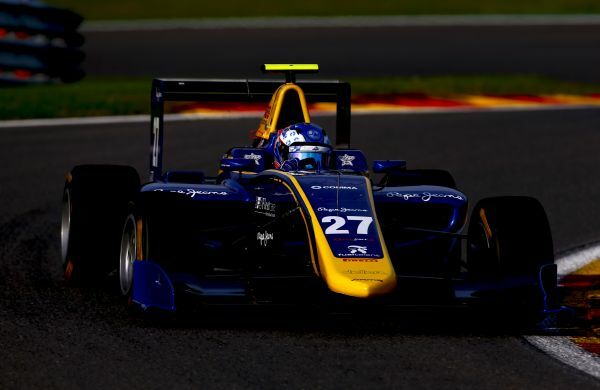 Fresh from his maiden race win in GP3; DAMS’ rookie Jake Hughes posted the quickest time in Free Practice for Round 6 of the Series at Spa-Francorchamps. The Briton’s best laptime of 2:06.160 was a mere 0.014s faster than fellow compatriot Matthew Parry (Koiranen GP). Renault Academy’s Kevin Joerg also from French squad DAMS completed the top three. There were several changes to the driver line-up for this weekend: firstly Colombian Oscar Tunjo returned to Jenzer Motorsport in the #19 car and secondly Niko Kari makes his GP3 debut for Koiranen GP. The Red Bull Junior replaces Ralph Boschung this weekend. Unusually for Spa-Francorchamps, the free practice session was run in sweltering conditions of 36 degrees with sunshine beaming down over the paddock. Trident’s Giuliano Alesi was first to take to the track with the field eager to resume to racing after the summer break. The Arden International trio of Jake Dennis, Jack Aitken and Tatiana Calderon led the way before Trident’s Antonio Fuoco was first to lap into the 2m08’s. Oscar Tunjo rose to second, matching the pace of the Italian before Campos Racing’s Alex Palou flew to the top of the timesheet dipping into the 2m07’s. Newcomer Kari impressed on his debut shooting to top spot at the midway point of the session before Fuoco returned to P1. ART Grand Prix’s and Scuderia Ferrari Team Development driver Charles Leclerc found some extra pace to rise to the head of the timesheet with five minutes remaining, as the positions swapped numerous times in the closing minutes. Parry lit up sector one and two to head the timings with Campos Racing’s Steijn Schothorst up to second. Joerg also improved to go third, with Nyck de Vries moving into P4. But it was Hughes who had more pace up his sleeve to claim top spot in the dying moments by the smallest or margins – just 0.014 over Parry. Hughes retained P1 at the chequered flag ahead of Parry, Joerg, Schothorst, Tunjo, De Vries, Leclerc, Artur Janosz, Fuoco and Kari. Qualifying takes place at 09.45 local time tomorrow morning (GMT+2).